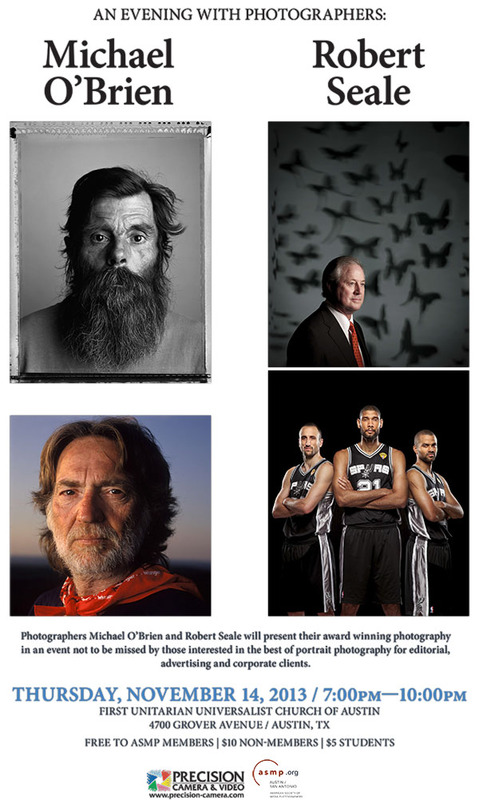 Photographers Michael O’Brien and Robert Seale will present their award winning photography on November 14, 2013. This is a not to be missed event for those interested in the best of portrait photography for editorial, advertising and corporate clients. Robert Seale is one of the most respected editorial and corporate photographers in the world. Robert Seale is a Houston photographer who specializes in photographing people for magazines, prestigious design firms, corporations, and advertising agencies. He is known for his diverse lighting skills and creative problem solving. His clients include Sports Illustrated, ESPN The Magazine, Businessweek, Forbes, Barron’s, Smithsonian, Air & Space, The New York Times Magazine, The Sporting News, ExxonMobil, BP, Major League Baseball, Tellabs, Schlumberger, Adobe, Reebok, and Under Armour.